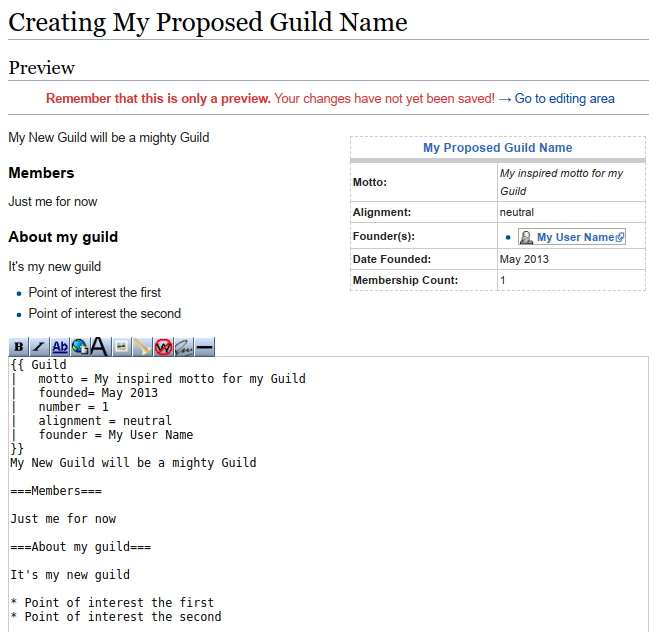 This template categorises an article as Category:Guilds and displays information about that guild. Note: All parameters are optional. Some will cause rows to appear if they are set. Others are only necessary to change default/automatic behavior. motto - The motto of the guild which will appear in italics. monster - The totem monster of the guild. Automatically links to its wiki page. rank - The high-level rank for the guild. number - The number of members in the guild. May be approximate (if so, precede the number with ~). leader - The current leader of the guild. Only the username; The god template is automatically fitted to it. founded - The date the guild was founded. founder - The member who founded the guild. Only the username; The god template is automatically fitted to it. Add entries for founder2, founder3, founder4, and/or founder5 if there are multiple founders. alignment - The alignment of the guild. gold - The gold fund of the guild (only put the number). forum - The forum thread of the guild. Should be the raw URL. pantheon - The rank the guild currently is in the Pantheon of Unity. pantheon2 - The rank the guild currently is in the Pantheon of Popularity. pantheon3 - The rank the guild currently is in the Pantheon of Duelery. town - The town in which the guild has the most influence in. date - The date all the data listed was collected on (things obviously change). You may include up to 5 ally guilds and up to 5 rival guilds. you must use the first parameter before moving onto the second and third one (eg. friend1 before friend2). Please only include the full name of the guild as it will be automatically linked to their wiki page. | motto = We rule! Start by searching in the Wiki for your proposed new Guild Name - in the Search Bar at top right. Copy and paste the block of text above at Example of use. Your main Guild Title will create automatically, as will the Category Guild link at the bottom of the page. Consult the Creators Manual for how to make headings, bold text, italics, links, images and so on. Once you are sure you have it right, click the SAVE PAGE button. Don't forget to tick the THIS IS A MINOR EDIT box for any small edits. This page was last edited on 18 December 2018, at 19:08.